Everyone could use a little more hope. “Do you know how magic works? The kind of magic that gets reindeers to fly in the sky? The kind that helps Father Christmas travel around the world in a single night? The kind that can stop time and make dreams come true? When we pulled “The Girl Who Saved Christmas” by Matt Haig off the library shelf we didn’t realize we were going to meet a remarkable girl, Amelia and her beautifully hopeful spirit. I don’t want to spoil the story for anyone. Suffice it to say, Amelia lives the kind of life that would typically strip anyone of hope…she is surrounded by difficulties. However, Amelia manages to hold onto her hopeful spirit. When she joins forces with Father Christmas, her hope helps to save Christmas. Amelia works as a chimney sweep in Victorian era England. Being a chimney sweep is a dusty, dirty, exhausting job. When my daughter and I were thinking of what ornament we would make – we looked to the chimney sweep brush. If you add a little colour to a chimney sweeper brush, it sort of looks like a pom pom on a stick! So we decided to make a colourful chimney sweeper garland. A hopeful and bright twist on Amelia. 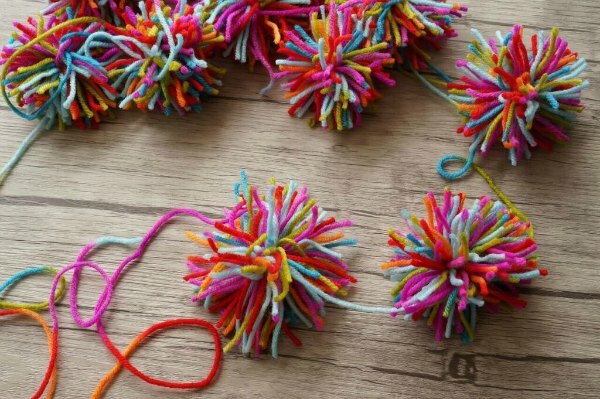 Okay, we tried all sorts of different ways to make pom poms. 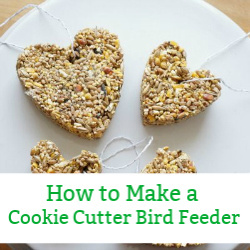 We tried using small forks, big forks, our fingers and more. We finally landed on a Craft Train’s template for a pom pom maker. We cut our template out of two pieces of a cereal box. We taped the two pieces together, to make them stronger. 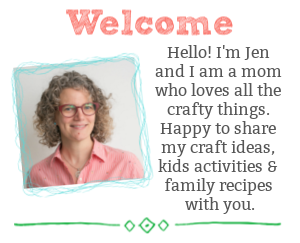 Once we had our cardboard pom pom maker, we started wrapping our yarn around the maker. We wanted our pom poms to look a little like a chimney sweeper brush – so we didn’t want a very dense pom pom. We wanted a looser looking pom pom. 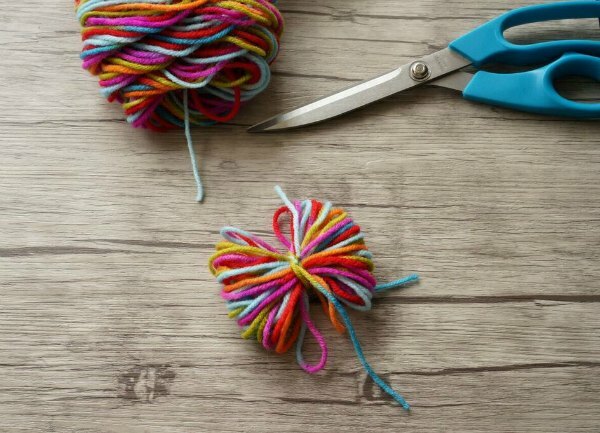 When you wrap the maker with as much yarn as you like, tie a piece of string around the centre of the pom pom and then slide the yarn off the maker. 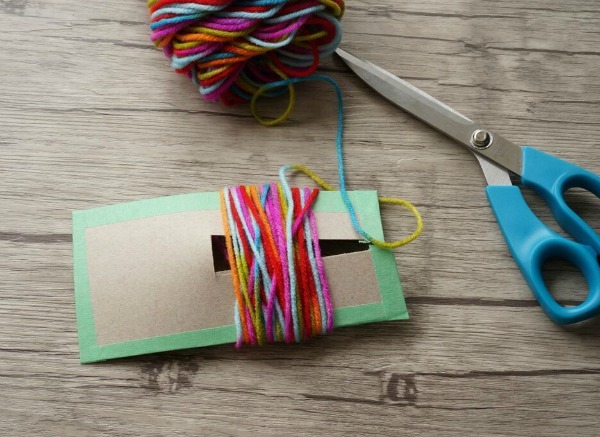 Tie the string around the centre again – as tightly as possible. 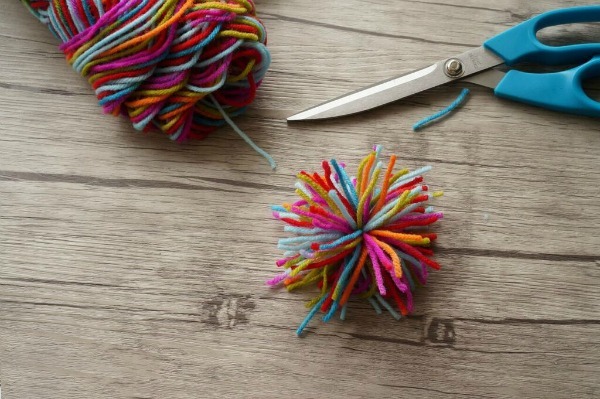 When the string is tied, it’s time to cut the yarn and puff out the pom pom. 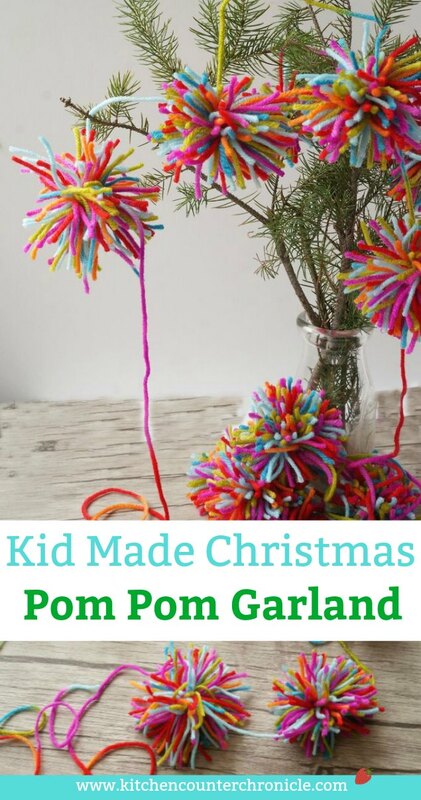 We made 12 large pom poms for our garland. The final step is determining how long you want the garland to be. Cut a long length of the yarn. 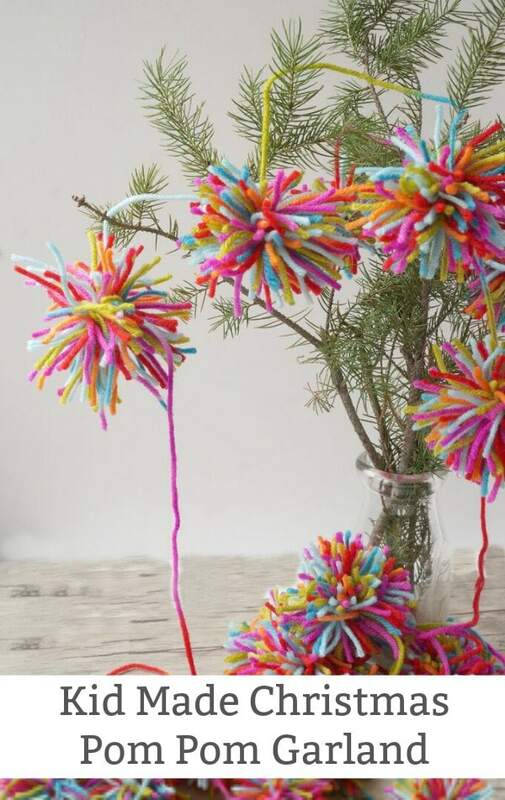 Use two piece of yarn from each pom pom to tie each pom pom to the long piece of yarn. 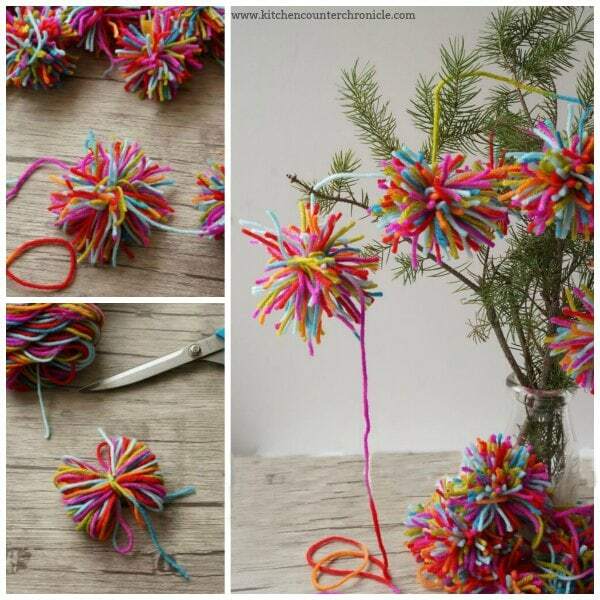 Slide the pom poms along the garland and hang the garland on your tree. 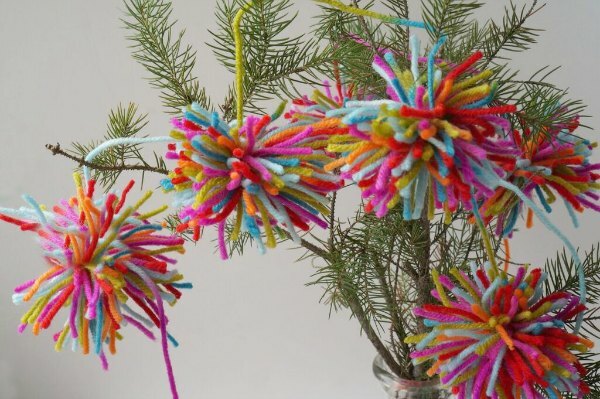 We love our cheery, joyful, colourful chimney sweep pom pom garland. To be honest it reminds us of Amelia’s hopefulness and you can’t see a chimney sweep and not think about Bert from Mary Poppins! 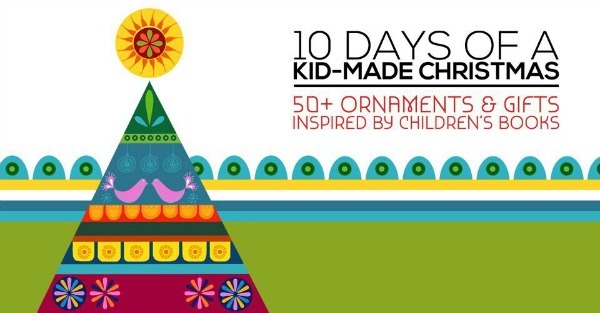 Today’s post is part of the 10 Days of Kid Made Ornament being hosted by Mama Miss. 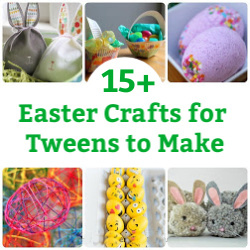 Be sure to check out all the other fabulous holiday ornaments that your kids will love to make. Boho is my fav – love this colorful garland Jen!